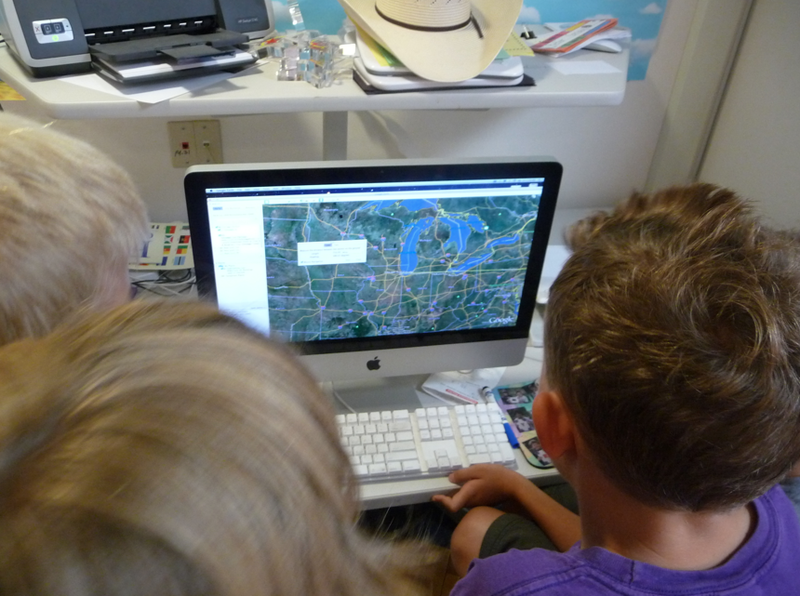 Mrs. Yollis' Classroom Blog: The Google Teacher Academy in NYC! Mrs. Yollis will be attending the Google Teacher Academy in New York City next week! Update: After attending, I wrote this post! Hundreds of educators from around the world submitted applications, and Mrs. Yollis is proud to say that she was one of the 50 selected. 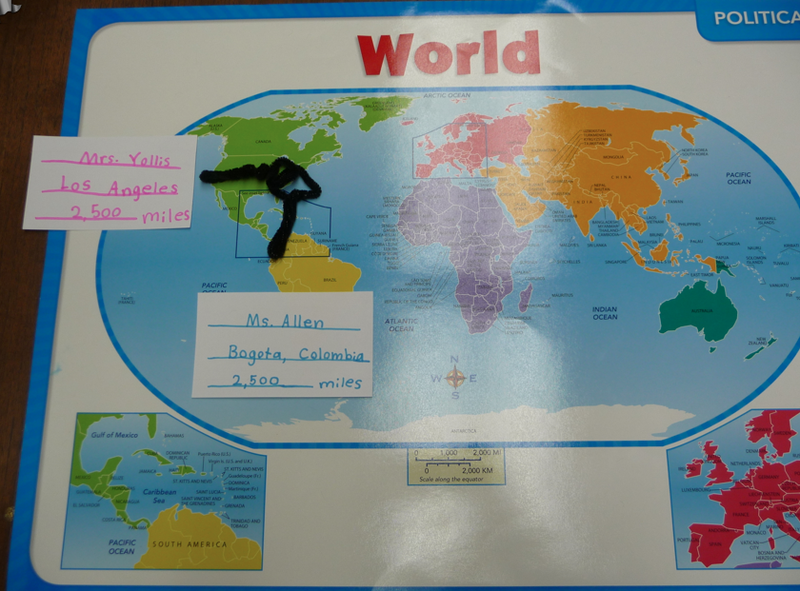 Most of the teachers are from the United States, but there are also educators coming from Mexico, Canada, Colombia, the Czech Republic, and South Africa. Part of the application process included making a one minute video. Here is Mrs. Yollis' video about Motivation and Learning. It was very difficult to tell a story in one minute! Mrs. Yollis is quite excited to meet all the new Google Teacher Academy educators! Even while playing word games, she can't seem to think about anything else! Today Mrs. Yollis' students examined the roster of teacher attendees. (An attendee is a fancy word meaning one who attends.) 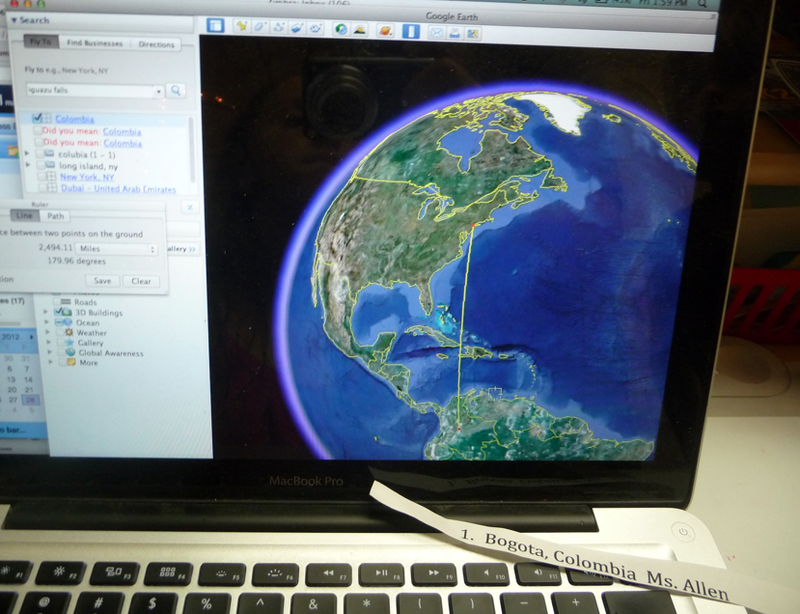 Next, the second and third graders used Google Earth to measure the distances some people will be traveling. The students have been learning how to estimate. The distances have been rounded. Some educators are traveling approximately 500 miles. One educator lives near Lake Michigan. Wow, the Great Lakes are enormous! Some attendees are coming from Europe or Asia. Most are traveling within the United States. 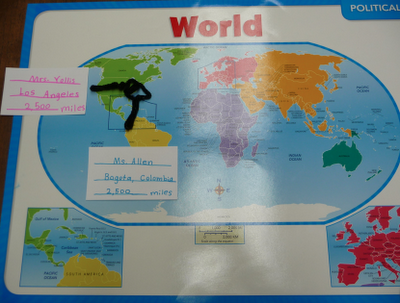 Ms. Allen is flying in from Bogota, Colombia. 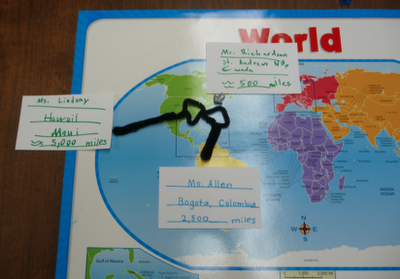 Abbey noticed that the distance Ms. Allen is flying is similar to the distance Mrs. Yollis is flying. Ms. Allen is coming from South America! Mrs. Yollis is flying in from Los Angeles. If was fun to compare the differences! 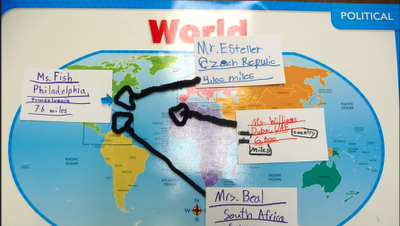 Ms. Beal is coming from South Africa. She is traveling the farthest. 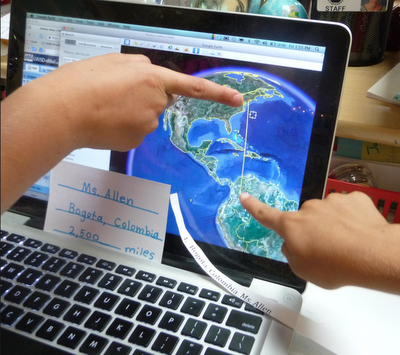 The class noticed she will cross the equator and the Prime Meridian! Go Ms. Beal! 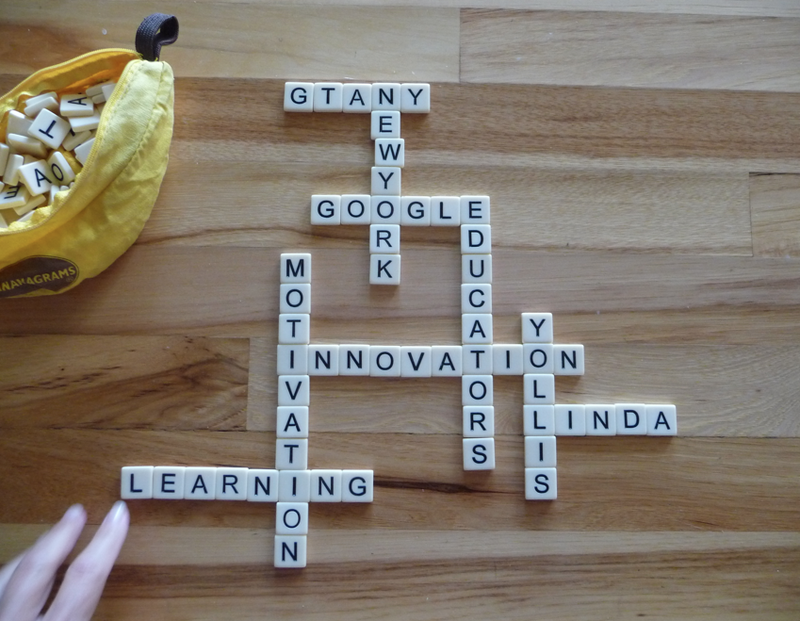 The Google Teacher Academy will be held in New York City. It will be a wonderful place to spend a few days. Here are some New York City fun facts! New York City (NYC) is an urban area. It is the most populated city in the United States. Do you know which city ranks second? What kinds of things do you think will be taught at the academy? 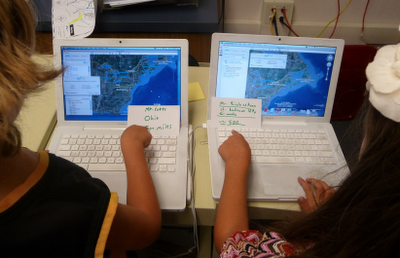 What did you learn from your Google Earth exploration? Congratulations Linda on the great video and on your acceptance to the Google Teacher Academy. You are a brilliant educator and learner and I want you to know that you are admired and followed in such far away places as Melbourne,Australia.You are inspirational. Have fun in New York. Visual Arts Specialist Teacher, Taylors Lakes Primary School, Melbourne, Australia. 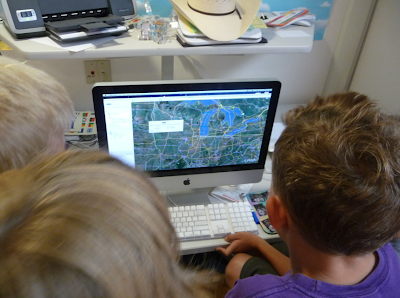 Educational blogging has truly flattened the walls of my classroom and connected us with such wonderful people. Looking forward to continued learning and sharing! Congratulations Linda for being being one of the few from SoCal! What a great way to share your experience with your students. I can see that you're a brilliant and dedicated teacher devoted to your craft. Can't wait to meet you in NYC! I love sharing my own learning with my students. It makes my classroom a learning community. Plus, they get to see that people continue to learn their entire lives, even teachers! 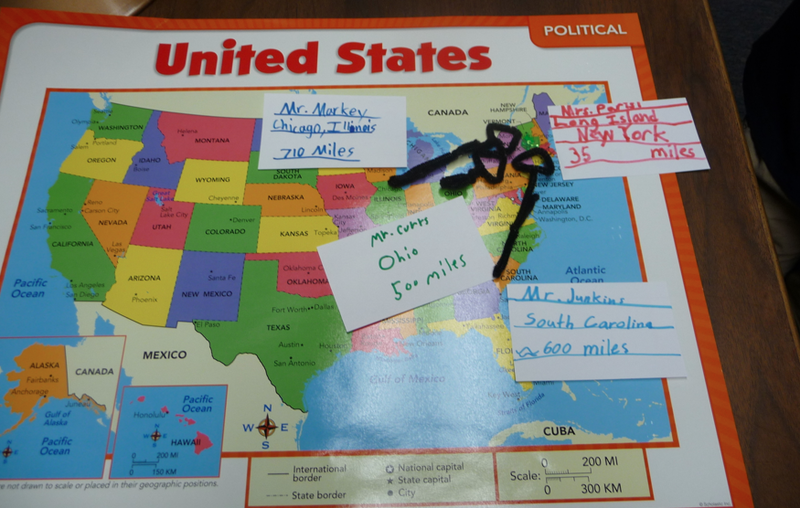 We had fun with maps, but were also able to practice rounding skills, correct use of proper nouns, and titles. 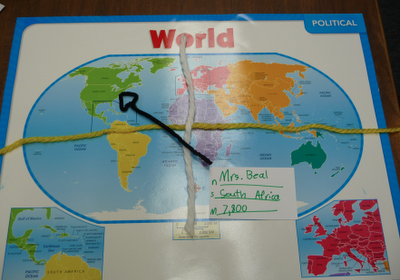 My students are in second and third grade, so there was a lot of discussion about the difference between a continent, a country, and a state. That concept is still confusing for some. Thanks for taking the time to drop us a comment! See you soon! CONGRATULATIONS on this VERY PRESTIGIOUS achievement! After experiencing your passion, creativity and great modeling of innovative technologies and learning first hand, I am not surprised that you were one of only 50 selected (out of hundreds of applicants!) for the Google Teacher Academy! We are most honored and proud to call you our teacher, literally "OUR" teacher, of students, parents, grandparents, etc., alike! I, for one, have benefited a lot from your innovative teaching as a parent and always learn something new from your blogs! You even motivated our family to utilize skyping to reach out to our far away family members in bringing us closer together, "live!" As I read the description of GCTs, I cannot think of a more fitting teacher as you live, breathe, exude and embody that very description in and out of the classroom every day: "Outstanding educators with a passion for using innovative technologies and approaches to improve teaching and learning", "creative leaders who understand opportunities and challenges, and have a desire to help empower others in their local community and beyond" and, "Ambassadors for change who model high expectations, life-long learning, collaboration, equity, and innovation." THANK YOU for being such a true Ambassador for change, for your passion and, for your direct action in our classrooms, community and beyond! Hope you have an amazing time in the Big Apple and, can't wait until you unveil all that you will have learned! Wow! Thank you so much for your high praise and congratulations! I certainly appreciate it! Having attended conferences where Google Certified Teachers (GCT) have presented and through Twitter, I've learned that the GCT are an innovative group and they love to learn and share. I am excited to join the ranks! I look forward to sharing my learning when I return! Congratulations on being accepted to the Google Teacher Academy in New York City! You and your students will undoubtedly gain a a wealth of information from your experience. Near and dear to our hearts, Los Angeles is the second largest city in the United States with a population of nearly 4 million people. Can anybody tell me what the 3rd largest city in the United States is? Thank you for your congratulatory comment and for your constant support. Your parents (Collin's grandparents) have been wonderful contributors to our blog. Here is a link to a post I did about them two years ago! Your family's participation demonstrates what a wonderful online learning community can be! Thank you for that! I love how you've kept the conversation going with a relevant question about population! Good job, blogger! Let's see who answers first! I know the answer to your question. The 3rd largest city in the U.S. is Chicago. The population of Chicago is 2.7 millon people. The city of Chicago has 234 square miles. Mom, tell what city has the least population is in the U.S? I discovered there are 5 cities in the United States with a population of just 1! Collin, can you tell me which state in the United States has the largest population? Thank you for the lovely information about the tiny cities. I know the answer to your question. The answer is California with a population of 37,691,912. There are 163,707 square miles. How do you think the people living in the tiny cities get food? Yes you are correct, California is the state with the largest population. I guess there are a few ways the people in those cities can get food. They might grow their food, they might order it online, or they might drive to a larger town nearby to shop. Would you like living in a town where you are the only person? Why or why not? I have multiple answers why I would NOT want to live there. First, there would be no one to play games with. Next, I would be seeing the same things every single day. After that, I would get so lonely. Finally, the city would most likely be the size of my house. Would you like to live there? If you had to which one of the five would you pick? I agree with you. No, I do not think I would like living in a town where I was the only person. I think I would be lonely. However, if I had to choose one of the cities, I would select Blakely Island, Washington beacuse it is close to Seattle, a city I like and because it would be a neat experience to live on a small island. Do you know anything about Seattle, Washington? I know what city ranks second. Where we live. Los Angeles! can anyone round up the population and square miles? I think some great places to visit in New York City are the Statue of Liberty and museums. When I was in New York I also loved FAO Schwartz toy store. What are other places for Mrs. Yollis to see? Are you taking Buck? If not, I bet he will miss you and be waiting at the gate for you. I will miss you too. Have a great time. I love your scrabble words. Congratulations on being accepted to the NY Google Academy. It will be another fabulous learning experience for you and packed with loads of fun I’m sure. The real winners will be your students because you are always connected to your kids and go above and beyond to share them. It is a pleasure and honor to follow you and your students down the learning path you plan for your classes. You continue to bring honor to the teaching profession. Wishing you safe travels. What a great post, Mrs. Yollis! Looking forward to meeting you in NYC and sharing our learning! A huge congratulations all the way down under. This is a huge honour to be selected and to attend the NY Google Academy. One that I know that you are so worthy of too. Have been a bit slow with blogging but as you know we are in holiday mood down under so hopefully will be right back on track once our holidays are over. Have a super time Mrs Yollis and I will be looking forward to reading all about your trip. After watching the video and seeing the photos, I would have selected you. Congratulations! Congratulations on being selected! Your post brought a huge smile to my face, and we are all so proud to have "our" teacher selected. Although, your selection doesn't come as a surprise to parents that have experienced first hand your dedication and creative teaching style. I am glad that Google was able to recognize this achievement as well. Of course it didn't hurt having a fabulous video to go with the application. I wish you to have a great trip and a safe return back to us with renewed energy. We look forward to seeing future posts about your experience. Nice to see how you are progressing in this field. Congatulations and bring back all you can for us begginers.If I can see myself at the level you are now, I will be the happiest learner. Congratulations! You made it to the NYC Google Academy! I was very surprised and happy that I was in your video. Last year I learned many things from using Google earth. 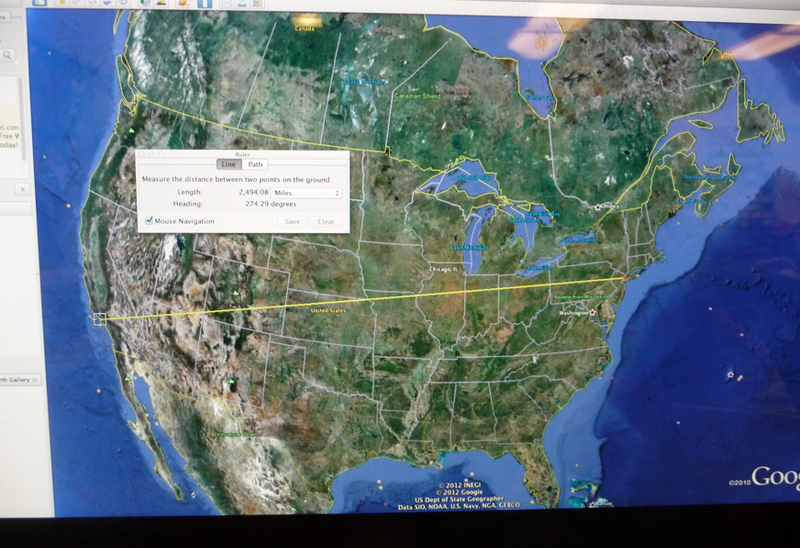 It was a very useful tool to figure out how many miles people lived from you. How long are you staying in New York? Will you have time to sight-see? I hope you are having a great time in New York City! Now I know why I didn't get in. I was up against fantastic teachers like you:) But I know you will share your learnings on here so I will still benefit in the long run. I only live about 75 miles away from New York City and my husband takes the train there to work several times a week. Some places that we like to visit there are the Plaza Hotel where Eloise had tea, the M&M store (you won't believe how many flavors and colors they have), Times Square (be sure to look for yourself on the big screen), and Central Park. Congratulations Mrs. Yollis! We are following your exciting trip and experience. Isabella is also in 3rd grade in Mr. Detamore's class and Sophia is in Mrs. Levy's 1st grade class. If you travel to the Upper West Side, Cafe Lalo is a fun spot for dessert and coffee. PS There was also an interesting article in the New York Times last week about technology and the timeframe for adults to adapt. Toddlers have been shown to swipe their fingers across book and magazine pages assuming it will respond like an iPad or smart phone. Apparently some adults are now automatically doing the same. There is also a taxi program in San Francisco where cabs are ordered and paid for via iPhones. The author of the article lives in San Francisco but visited NYC and jumped out of the cab not paying because of being used to the app. Thought you might like that anecdote while in NY though probably best not to try the same! Congrats again and enjoy the week and city! Google chose wisely! I'm thrilled for you! I'm sure you'll learn so much, and I look forward to learning from you! Your students are in for a treat from all you'll bring back to them. Congratulations, and enjoy NY! Congratulations! We would like to know how you enjoyed Google Teacher Academy? We just started following your blog. We think it is delightful. Congratulations Mrs. Y♔llis! I hope you had a great time there. Today you told us that you were going to another school to learn stuff, and after that you are going to teach other classes on "How to Comment." First, you want to have a good greeting, so you would type like dear, hi, hello, and some times hey. Second, you can add some information that is relative to the post. Try adding some questions too. Then when you are finished with the comment, sign your name, then type an ending. They are sincerely, warmly, thoughtfully, and your ________-loving student (buddy or friend). Last hit the preview button (not the publish button) at the bottom. Always preview your comment before publishing. Have fun commenting!